What is strategy and are you sure your business has one? What is Strategy and are you sure you have one? A business plan is the embodiment of one of your organisation’s most important assets – its strategy. The problem is that ‘strategy’ – in a profit or not for profit context – is a poorly understood term. To be really effective, a strategy has seven inter-linked and critical components. Each component must be completed, if any element is missing then at worst, failure lies ahead, at best the effectiveness of our strategy is severely reduced. For example, poor resource planning and ineffective communication can reduce the effectiveness of any strategy by over 10%. But firstly, what is strategy? Many books have been written about strategy. True, a strategy tells us who our customers are, what we’re going to provide to them and how we’re going to do it, but at the simplest, (which is best), strategy is essentially a way of being unique, uniqueness that will deliver real value to our stakeholders. The driving quest for uniqueness, which can just mean doing straightforward things that our customers value really well in way that your competitors can’t, is a great quality that as leaders we need to embed firmly into our organisations. So, now on to add a little more detail. As we craft a strategy, which is the centrepiece of our business plan, we need to remember to attend to seven different components. #1: Vision of the Future. This is the most important component – and very few organisations get it right. For example, research tells us that well over 90% of leaders feel that they should spend more time thinking about the future. This is a really common problem that has impacted the biggest of corporations. Kodak, Polaroid, Woolworths, Blockbuster, are just a few of the names that spring to mind when we think of companies that may have failed to act proactively as the outside world changed. So, a good well thought out view of the future is the foundation stone. It is your responsibility to ensure that a really good view of the future arena (‘arena’ is the place where you will do business) is produced. Think about new entrants, supplier power, distributor power, the possibility of substitutes for your business’s offerings, changing customer needs, technology, demographic shifts, the economy, and political and regulatory influences. Try to keep an open mind and don’t immediately dismiss ‘off the wall’ threats. Relying on ‘what worked for us before’ can be dangerous when thinking about the future. Remember that Blockbuster, the defunct video retail chain, once rejected the opportunity to buy Netflix and that Kodak, who developed the first digital camera, just thought that digital was a ‘cute’ idea. Relying upon the commonly-accepted views of others as to what the future holds can be dangerous too. Cast your mind back to before the Great Recession – commonly-accepted thinking told us that that another recession was impossible. Your view of the future should be just that – your view and your team’s view – and don’t forget that this view of the future is one step towards uniqueness. #2: The Arena. An arena can be thought of a group of customers with similar needs (the ‘customer segment’), the product and how that product is going to be delivered. Be as specific as you can about defining products, potential customers, geographic areas and how you will get to your customers. 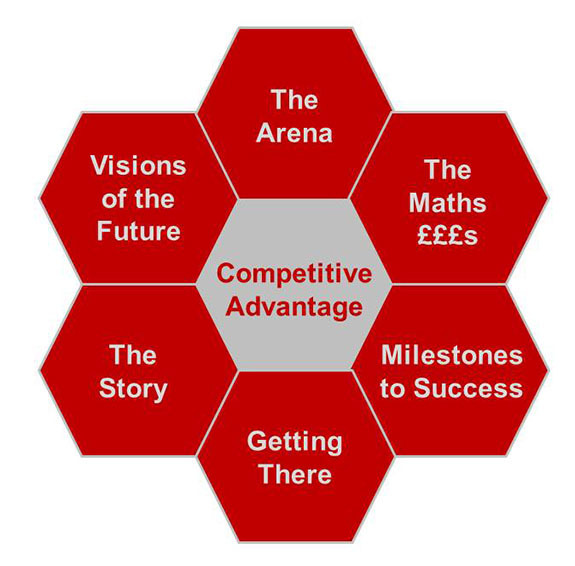 Defining arenas is important – very few businesses just compete in one arena – and each needs its own strategy. Failure to define who our ‘target’ customers really are means confusion when we try to put the strategy into action! So, at this simplest level, this is all about defining in straight-forward terms who our target customers are. #3: Competitive Advantage. This is how the organisation’s products are different from the competition’s products. A classical approach is to firstly decide whether or not the organisation is going to target a very broad range of customers or only a very specific niche. The second decision then is about whether or not the business will be different from the competition by either (a) having the lowest cost base or (b) designing a product that is better than the competition’s offerings. Some more recent thinking argues that organisations can simultaneously have the lowest cost base and provide a better product. That might be true, but this needs sophistication and clarity within the organisation – otherwise it will end up doing neither and be ‘stuck in the middle’ – with no advantage. There is also thinking that when decisions have been made about the product and the cost base, we should also consider the experience that we offer to the customer when the customer inter-acts with us. The thinking behind this is that in our Internet-enabled age, it’s increasingly difficult to have offerings that are different, for long periods of time, from those of the competition. We therefore need to look beyond the traditional offering for sources of ‘difference’. ‘Customer experience’ innovation and delivery is a hot topic! We must not forget that we have to maintain competitive advantage and in today’s fast-moving and uncertain world that means defining how the organisation will explore and learn. A good strategy should define therefore where exploration, learning and innovation will take place. The strategy process – how a business creates its strategy – is moving away from a once a year exercise towards a continuous learning loop. As time moves on, we can expect this ‘learning loop’ element to be an increasingly important part of the strategy process. Also consider the threats that your organisation could face. Take time to consider ‘what would do if?’ when you are crafting strategy – it’s a great opportunity to build increased resilience! #4: The Maths £££s. There must be an explanation of how the strategy will generate profits. This is really an explanation of how the financial budgets will come to life. Take this opportunity to identify any offerings that are unprofitable or possibly only marginally profitable. Make sure there’s a clear message that identifies which products and customers you think are the most attractive – and profitable! It’s surprising how many organisations don’t have a clear grasp of where money is being made – or lost! #5: Getting There. This is all about the route that will be taken. Are we talking about organic growth, adding new products, diversification, acquisitions, mergers, licensing, new distribution routes, new markets? #6: Milestones to Success. This component is the implementation plan. How the organisation must act and change to implement the strategy and hence achieve the business’s objectives. Don’t forget to look at how your most valuable resource – people will be affected – particularly in terms of their development. This is not just about time-based milestones. It is also about the resources that are needed and control measures that must be used to ensure everything is on course. #7: The Story. Very much a forgotten component! It’s what makes things happen. To work, a strategy must be communicated. The story must be simple, contain a clear vision of the future and clearly say how the business will gain competitive advantage and bring benefits to all stakeholders including staff. The story must generate commitment and above all, energy. Make sure your strategy addresses each of these seven dimensions. And if you did – please do sign up to my newsletter to get my latest thoughts straight to your email inbox! Mankins, M. and R. Steele, “Turning Great Strategy Into Great Performance,” Harv. Bus. Rev., July-August, pp. 64–72, 2005. G. Day and P. Schoemaker, “Scanning the Periphery,” Harv. Bus. Rev., November, pp. 135–148, 2005. R. McGrath, “Transient Advantage,” Harv. Bus. Rev., June, pp. 62–70, 2013. G. Neilson, K. Martin, and E. Powers, “The Secrets to Successful Strategy Execution,” Harvard Business Review, June, pp. 60–70, 2008.